Time to Play: 20-30 Min. 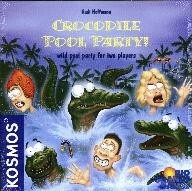 The crocodiles are loose in the luxurious hotel swimming pool! Just seconds ago, the vacationers were enjoying the cool water of the pool, but what is that? A crocodile has just entered the pool - and now there is one less swimmer! Wow! There's another croc - and another - and another. As the number of crocs in the water increases, the number of swimmers drops! But, the crocs hunt not only the hapless swimmers, but also other crocodiles. Thus, all in the pool strive to save themselves! The plaeyr who brings the most swimmers and crocks to the safety of the end of the pool, wins the game!